Momentary - switch returns to its normal position when released. For example: the simplest on-off switch has one set of contacts (single pole) and one switching position which conducts (single throw). The switch mechanism has two positions: open (off) and closed (on), but it is called 'single throw' because only one position conducts. Switch contacts are rated with a maximum voltage and current, and there may be different ratings for AC and DC. The AC values are higher because the current falls to zero many times each second and an arc is less likely to form across the switch contacts. For low voltage electronics projects the voltage rating will not matter, but you may need to check the current rating. The maximum current is less for inductive loads (coils and motors) because they cause more sparking at the contacts when switched off. A simple on-off switch. This type can be used to switch the power supply to a circuit. When used with mains electricity this type of switch must be in the live wire, but it is better to use a DPST switch to isolate both live and neutral. A push-to-make switch returns to its normally open (off) position when you release the button, this is shown by the brackets around ON. This is the standard doorbell switch. A push-to-break switch returns to its normally closed (on) position when you release the button. This switch can be on in both positions, switching on a separate device in each case. It is often called a changeover switch. For example, a SPDT switch can be used to switch on a red lamp in one position and a green lamp in the other position. A SPDT toggle switch may be used as a simple on-off switch by connecting to COM and one of the A or B terminals shown in the diagram. A and B are interchangeable so switches are usually not labelled. A special version of the standard SPDT switch. It has a third switching position in the centre which is off. Momentary (ON)-OFF-(ON) versions are also available where the switch returns to the central off position when released. A pair of on-off switches which operate together (shown by the dotted line in the circuit symbol). A DPST switch is often used to switch mains electricity because it can isolate both the live and neutral connections. A pair of on-on switches which operate together (shown by the dotted line in the circuit symbol). A DPDT switch can be wired up as a reversing switch for a motor as shown in the diagram. A special version of the standard SPDT switch. It has a third switching position in the centre which is off. This can be very useful for motor control because you have forward, off and reverse positions. Momentary (ON)-OFF-(ON) versions are also available where the switch returns to the central off position when released. This looks like a momentary action push switch but it is a standard on-off switch: push once to switch on, push again to switch off. This is called a latching action. 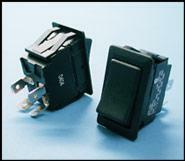 Microswitches are designed to switch fully open or closed in response to small movements. They are available with levers and rollers attached. A key operated switch. The example shown is SPST. Tilt switches contain a conductive liquid and when tilted this bridges the contacts inside, closing the switch. They can be used as a sensor to detect the position of an object. Some tilt switches contain mercury which is poisonous. 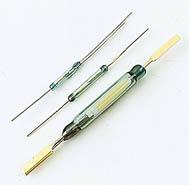 The contacts of a reed switch are closed by bringing a small magnet near the switch. They are used in security circuits, for example to check that doors are closed. Standard reed switches are SPST (simple on-off) but SPDT (changeover) versions are also available. This is a set of miniature SPST on-off switches, the example shown has 8 switches. The package is the same size as a standard DIL (Dual In-Line) integrated circuit. This type of switch is used to set up circuits, e.g. setting the code of a remote control. The picture shows a 6-pole double throw switch, also known as a 6-pole changeover switch. It can be set to have momentary or latching action. Latching action means it behaves as a push-push switch, push once for the first position, push again for the second position etc. Multi-way switches have 3 or more conducting positions. They may have several poles (contact sets). A popular type has a rotary action and it is available with a range of contact arrangements from 1-pole 12-way to 4-pole 3 way. The number of ways (switch positions) may be reduced by adjusting a stop under the fixing nut. For example if you need a 2-pole 5-way switch you can buy the 2-pole 6-way version and adjust the stop. Contrast this multi-way switch (many switch positions) with the multi-pole switch (many contact sets) described above.